Russian Ambassador to Poland Sergei Andreev has prompted an outrage of Polish Ministry of Foreign Affairs putting some of the blame for World War II on Poland. The Ministry responded saying the narrative presented by Russian Ambassador «challenges historical truth and invokes some of the most mendacious interpretations of events». In reality the words of Ambassador dovetail with historic facts. Can anybody imagine Russia promoting the views of someone who called for establishing an alliance with Nazi Germany after Hitler came to power? Or can anybody imagine Russian historians expressing regret over the «blunder» made by the Soviet Union standing up to Nazism instead of joining Hitler in his efforts to conquer Europe? All of this is possible in Poland. The works of Władysław Gizbert-Studnicki and Adolf Bochenski, the authors of post-war years, are popularized there. The both welcomed the potential alliance between Poland and Germany. Władysław Gizbert-Studnicki stands out as a fervent Teutophile. A year passed since Nazi came to power in Germany. In 1934 the country was hit by a wave of arrests and executions by firing squads. That was the time when he wrote his «Political System of Europe and Poland» to espouse his views on creating a Polish-German alliance to exercise joint control over Europe. According to him, «Poland and Germany can become the foundation of a large Central European bloc, together with Austria, Hungary, Czech, Romania, Bulgaria, Yugoslavia, Turkey, Greece and the Baltic states: altogether, 200 million people. 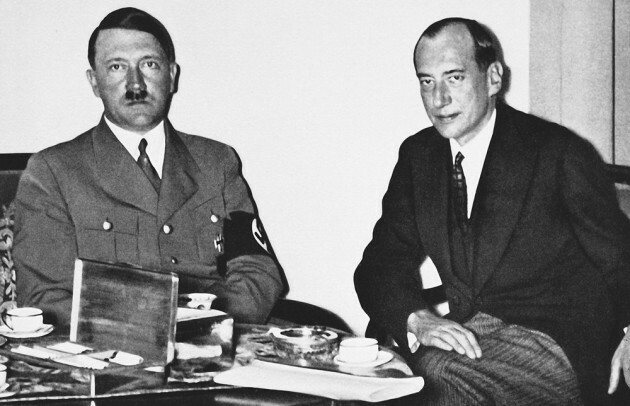 It is no coincidence that pursuing the main goal of freeing Germany from the power of France, Hitler had a good reason to start with... establishing close ties with Poland». He believed that the traditional close relationship between Poland and France led nowhere. In his opinion, it was equal to encirclement of the Reich by France and the Soviet Union. Instead, he offered to apply maximum efforts to provide Berlin with access to Eastern Prussia across the territory of Poland (a transport corridor Berlin-Warsaw-Königsberg). Under Hitler Prussia became associated with German militarism. Gizbert-Studnicki believed that the existence of this nest of international brigandage near Polish borders would bring only benefits to Poland. He was inspired by anti-Semite Nazi theories. Even when Germany seized Poland, he continued to support the idea of joint crusade against the Soviet Union. His last letter to Himmler devoted to this issue was written on March 12, 1945. In 1948 he volunteered to defend Field Marshall Erich von Manstein, but the court decided not to send for him. After the war he wrote the book titled «Tragic Days». It was called «How I Did not Become Polish Vidkun Quisling» originally (in 1951 the book saw light translated into German with the subtitle «Struggle for Polish-German Rapprochement» and under the different name – «Poland: Going Wrong Ways»), but Mieczyslaw Grydzewski, editor in chief of «Polish News», which published the book, decided to change it. He did not want to stun readers with the revelations of the man who failed to become a Polish Quisling (Vidkun Quisling – a Norwegian collaborator sentenced by court to face a firing squad in 1945). Adolf Bocheński also pondered the possibility of alliance between Warsaw and Berlin. He viewed the Third Reich as an instrument to be used by Poland to change the borders in Central and Eastern Europe, including the gains to be made after the debacle and dismemberment of the Soviet Union. He believed that Hitler took defensive actions to secure the Reich’s eastern borders. At that he did not exclude the emergence of Poland-Germany-Galicia alliance to launch an offensive against Kiev and Moscow. To promote this plan he called for a dialogue between Poland and Ukrainian nationalists supported by Hitler’s Germany. In 1951 the books of Władysław Gizbert-Studnicki were banned and confiscated from libraries. The works of Bocheński have not been republished. But in the contemporary (post-Communist) Poland the ideas of Gizbert-Studnicki and Bocheński are studied again as an example of alternative geopolitical thinking at that time. These ideas found some support among Polish educated people. In 2012, Professor Paweł Wieczorkiewicz of Warsaw University expressed regret over the fact that Poland did not join Hitler. According to him, in December 1941 Germans lacked 4-5 divisions and 100-200 tanks to accomplish the mission during the battle of Moscow. The Polish military could add 60 divisions and 1000-1500 tanks becoming a factor to decide the outcome of the war in the east. He believes that as a German ally Poland could get Ukraine, Belorussia and part of Russia under its control. Józef Beck, the Polish Foreign Minister in 1939, ignored the legacy of Pilsudski, who said that to survive Poland should never start a war or wage it on its territory. The professor is sure that in alliance with fascists Poland would have been engaged in combat actions far in the east after joining the war on the side of Germany. In 2012 Piotr Zychowicz, a young Polish historian, published a book titled Pact Ribbentrop-Beck, or How Poles could have defeated the Soviet Union alongside the Third Reich. While Western historians and politicians spare no effort to smear the Soviet Union for signing the 1939 non-aggression pact with Germany, Zychowicz offers to think about the probable consequences in case a Beck-Ribbentrop Pact were concluded. He says Poland should have made concessions to Hitler, and agreed for annexation of Gdansk (the Free City of Danzig) into the Third Reich, as well as for the construction of an extraterritorial highway across the Polish Corridor (through Pomerania to Eastern Prussia). And then, together with the Germans, Poland should have attacked the Soviet Union. Forty divisions of the Polish Army fighting on the Eastern Front would have led to the defeat of the Red Army, saved Poland from 60 years of «Soviet occupation» and allowed to resurrect Rzeczpospolita within the borders of XVIII century (Zychowicz is sure that Fuhrer would have given Ukraine, Belorussia and Lithuania to Poland). It’s not enough to say that Poland is partly responsible for starting the Second World War. The climate of opinion is permeated by frustrated dreams resulting from the fact that Rzeczpospolita II and Germany did not sign a pact. On and off, the issue of «lost opportunities» hits the agenda of public and scientific community discourse. Do Polish people realize what it may lead to?